BETTER LEGS in just 10 minutes a day! 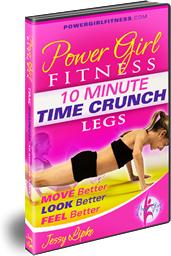 If you are NOT 100% SATISFIED with how you LOOK and FEEL after using my Power Girl Fitness System for 60 days……..
Just send me an email explaining WHY you’re not totally delighted with your results, and I will personally REFUND you 100% of your cost, PLUS you can KEEP THE WORKOUTS! That YOU will have SUCCESS! That’s a Power Girl PROMISE! See you at our next workout…..